I love the beautiful colors in our garden in the spring, especially our bougainvillea! Spring is a time of renewal, rebirth and rejuvenation with new colorful flowers, longer days and lighter fare. Spring entertaining offers an opportunity to get back outside for exercise, cooking outdoors on the barbecue and enjoy dining al fresco. This month I offer some great ideas for healthy spring cooking and entertaining! Tropical Mango Mahi. Click here for the recipe! 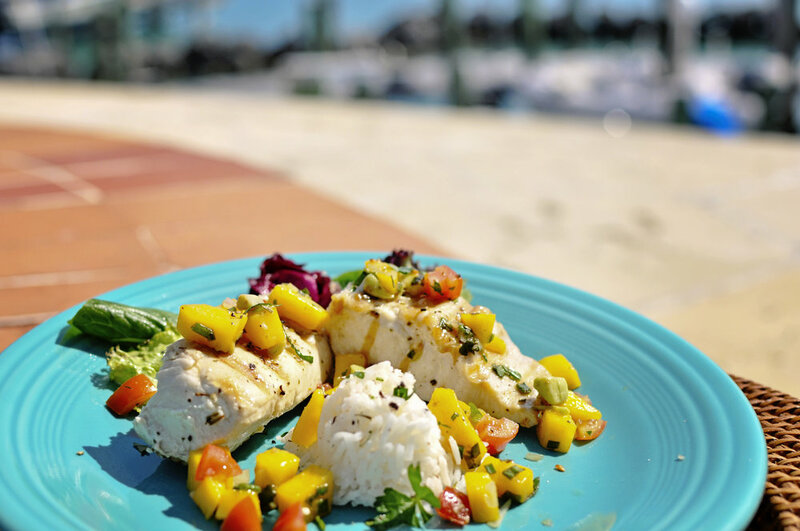 This month's feature recipe is my Tropical Mango Mahi, grilled and served with a colorful and flavorful mango salsa, this flaky light fish is the perfect healthy meal, and oh so satisfying! Served with coconut rice, this tropical dish will make you feel you are living the island life at home! So simple to prepare in less than 20 minutes total prep and cooking time, you can enjoy your guests and being outdoors with this delicious and easy dish. Enjoy with a nice light Sancerre, Pinot Grigio or Sauvignon Blanc. Spring desserts are all about being light. This luscious lemon soufflé is just that! Light, lemony and delicious. It can be served warm or at room temperature on its own or with a luscious lemon creme anglaise. It could even be served cold with fresh whipped cream! Simple to prepare in advance, perfect for al fresco entertaining! I can't wait for spring to be able to be creative with outdoor "al fresco" dining! It doesn't have to be elaborate or time consuming. Use your own outdoor environment as a landscape and keep it beautifully simple. I love a comfy, casual, shabby chic look with clean simple colors. Enjoy al fresco dining in your beautiful room without a roof!